Sponsored Post: Even though I received compensation for this post, all thoughts are my own and this cookbook is something I truly love and want to share with my readers. This post contains affiliate links for your shopping convenience. View our full disclosure policy HERE. A few years ago, my friend Joya from Live Love Serve Teach, recommended the cookbook 100 Days of Real Food to me. It changed my life as the head shopper and cook at our house. So many of the foods I was buying that I thought were healthy, were just fabulously marketed products and I fell into the trap of buying them. After reading Lisa Leake's book and hearing about her family's journey to cut out processed food, I was so inspired. I became better at reading labels and finding replacements for some of the items that I thought were healthy. She reaffirmed for me what I had always know - we were eating healthy and we needed to continue to eat a balanced diet with real food and cut out as much processed food as possible. It wasn't some crazy fad diet - it was just changing our mindset and being a more aware shopper. Now that's not to say that we eat no processed food. I get my girls Cheetos as a treat and Dunkin Donuts is our guilty pleasure after church each week. But, I feel better about those treats because of how we eat for most of the week. 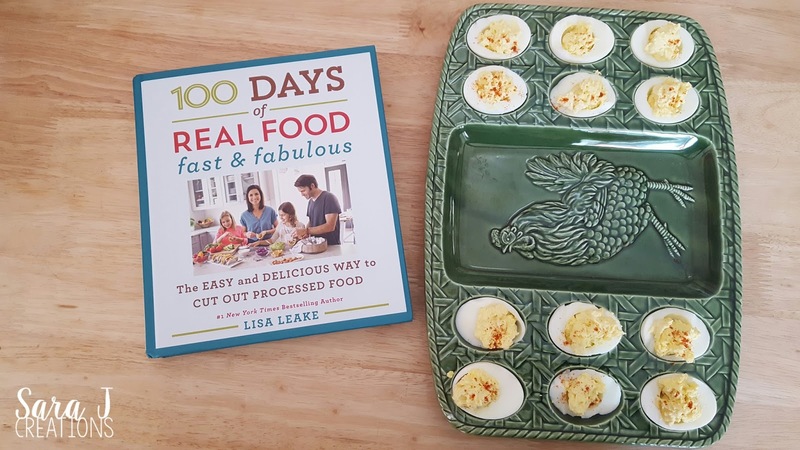 When I heard that Lisa was coming out with a second book (100 Days of Real Food: Fast and Fabulous) and the recipes were designed to be FAST ways to eat real food, I was so excited that I immediately added it to my Amazon wishlist. Imagine my surprise when I got the chance to read the book before it was released and share my thoughts on my blog. When I first opened the book, I immediately read chapter one, which was all about supermarket staples and secrets. This is exactly what I need when I grocery shop. It goes through the main food groups and tells you exactly what to look for and what to avoid. Lisa shares some of the names that processed food goes by that tries to tricks us as consumers. 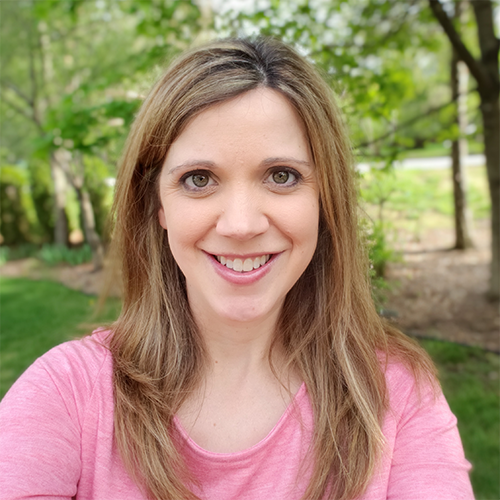 She also addresses some common terms that we hear and often think (falsely) that they are good for us such as natural, multigrain, low fat, and sugar free. She also goes through 9 supermarket chains and her favorite real food options available at each one. I feel like I want to rip these pages out and carry them around with me when I grocery shop. So much good information to help me be a more educated consumer. Another great feature in this cookbook is the meal plan option. Lisa takes her recipes from the book and groups them seasonally so you could easily plan out a week of meals and your shopping list. Such a time saver for people who are busy or parents like me who hate going to the grocery store and just like ordering them online - having a list ready ahead of time saves so much time. After I went through chapter one, I started flipping through the recipes. They are broken down into breakfast, lunch, salads, sides, snacks & appetizers, soups & stews, simple dinners, special treats and homemade staples. I instantly started making a list of what I could make with ingredients we already had on hand. My first attempt was her deviled eggs (Sienna's Deviled Eggs page 83). I've made these in the past (but with mayo) so I liked that this was a healthier option. My girls like egg salad and sometimes they like hard boiled eggs but the yolk often gets left behind. I was curious what they would think. I whipped up a batch and used the fancy vintage deviled egg tray my mom gave me years ago. Let's just say this was a hit. All the eggs were gone in a matter of minutes. My girls and I couldn't stop eating these. They will definitely be on repeat at our house. I bought my Nutri Ninja Blender last winter and we were on a major smoothie kick all winter and spring. I tried making green smoothies but never got it quite right. I was mixing in too many other things that were changing the color of it or it would make it so it wasn't very sweet and my girls weren't interested. When I tried Lisa's Honeydew Green Smoothie (page 161), it was an instant hit. The hardest part was cutting the fresh fruit but I took the time to cut it all so that we would have it ready to go for the next few days. 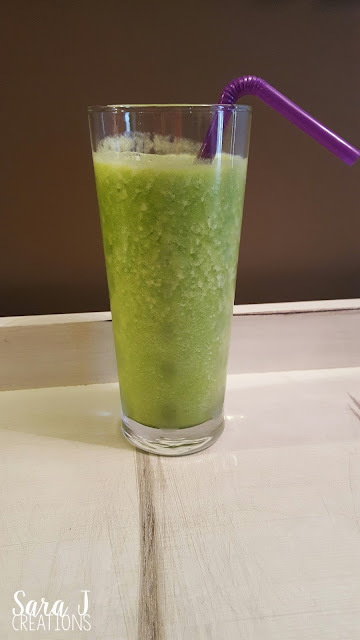 It was the perfect green smoothie - sweet but not too sweet with nothing but fruits and veggies and water. I think I might even use these as a Frankenstein smoothie this week for my daughter's preschool class. I have always been intrigued by the concept of overnight oatmeal. I think you normally eat this cold but I couldn't wrap my head around that. 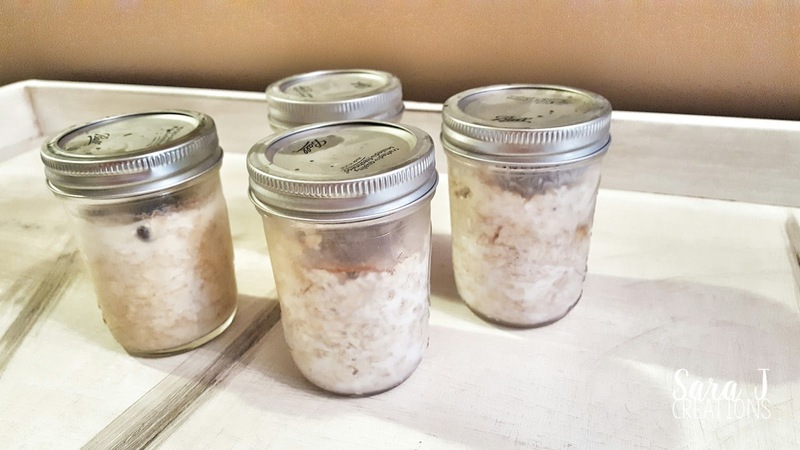 I made individual portions like Lisa suggested (Our Favorite Overnight Oats page 62) and put them in the fridge overnight. In the morning, I heated them a little bit and served them. The girls liked the addition of raisins since normally they have blueberries in their oatmeal. Apparently I was on a breakfast kick, because my next attempt was the California Omelet (page 70). 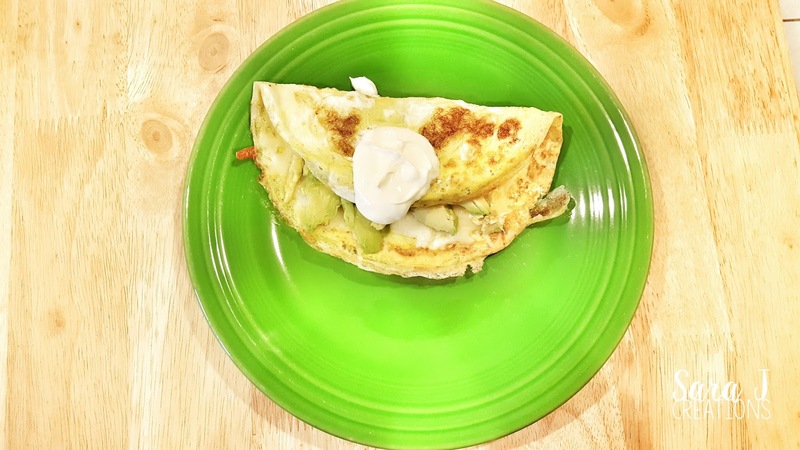 I love avocado in anything so to this omelette was right up my alley. The thing that made this different than what I normally make was the sour cream on top. I've never added sour cream to my eggs but it was actually a really good addition. And again - it was fast and easy!!! 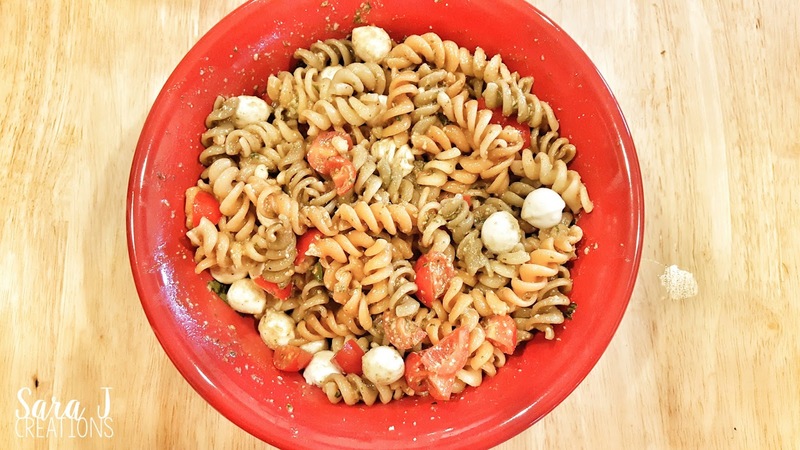 My absolute favorite recipe that I tried so far was the Caprese Pasta Salad (page 95.) I will pretty much eat anything that says caprese and has fresh mozzarella in it. I like that this version includes pesto because making pesto had been on my to do list and this forced me to make and freeze a bunch with the rest of the basil in our garden. I think if you had this in the summer you could serve it cold but for fall it was perfect served warm. I didn't have whole wheat noodles on hand so I substituted 3 veggie noodles instead and served it warm as a side to our dinner. It was so good and I couldn't stop eating it. It pretty much included all my favorites - cheese, tomatoes, balsamic vinegar, pasta, making the garlic breath from the pesto totally worth it!! I cannot wait to try some more of these new recipes, especially the dinner ideas. I like that these options truly are fast. In flipping through, most include common and easily found ingredients that I often buy anyway. There are so many recipes that I want to try and I know will be a success with my girls. I always love seeing Lisa's lunch ideas too. Even though I'm only packing a lunch for my daughter twice a week at this point, I'm still always looking for new ideas for her lunchbox. That is one of my favorite parts of Lisa's instagram account (100daysofrealfood) - when she shares what she packed her daughters for lunch. 100 Days of Real Food Fast & Fabulous comes out this Tuesday (October 25, 2016). If you pre-order it on Amazon, you are guaranteed the lowest price. 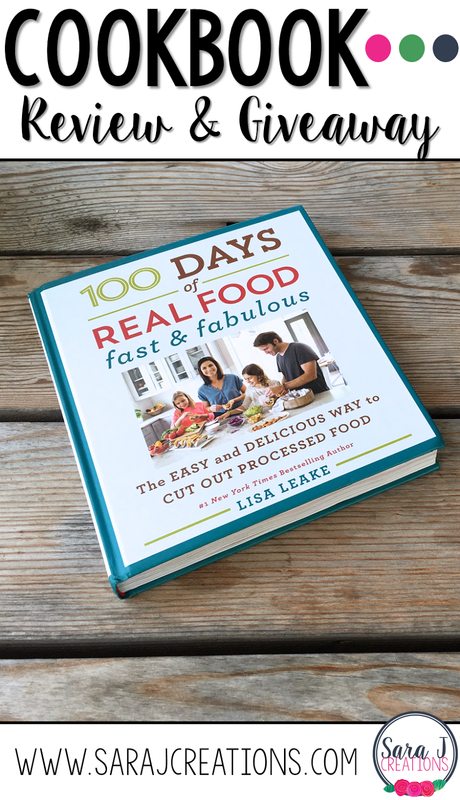 You can also grab some of the recipes in this book along with SO many others on Lisa's blog, 100 Days of Real Food. This is a cookbook you don't want to miss out on if you are looking for quick and easy recipes with real food - no canned or processed food added. Plus, all of the extras in the beginning to make you a more savvy shopper and label reader are just an added bonus. Because I want you to have the chance to try out some of these recipes to make your busy life easier, I am giving away my second copy of this book to a lucky blog reader. Just enter below! Winner will be picked and sent a copy of the book next week.